This is my second New York State record buck. My first was taken in 1987, a 12-pointer that scored 156-2 B&C and weighed 220 lbs. The '87 buck came a little easier than my 1995 buck. My wife and I like to set our treestands a week or two before the hunting season and at the same time scout for any deer signs that can tell us what areas we should hunt. Opening day came in 1987, we were in our spots for about an hour and a half when we spotted the 12-point buck. I shot, hitting his vitals, and my wife took a second shot to bring him down. What a sight! 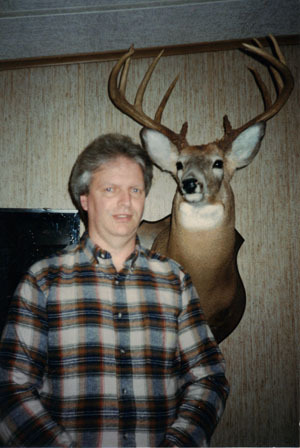 My 1995 buck is a 10-point typical, scoring 179-3 B&Cand weighing 195 lbs. I had no idea how big of a buck I was hunting until the last few days of the season. One afternoon around 2:30 pm, I was walking back to my treestand. I hadn't quite made it there when I spotted a huge buck just yards from my stand. I brought my gun up and got him in my sights. Then, for no reason at all, he took off. I knew he hadn't winded me or saw me. So I took off running to my house to get help from my 16 year old son, Wade. I sent Wade to head the buck off near the swamp area and I went back to where I first spotted the big buck. I waited there for an hour thinking that my son and I would never see that beautiful buck again. Just then, a big doe stepped out into the same spot where the buck had been standing eatlier. Who do you think was following her? The big 10-pointer. I got my gun up and the buck in my scope as the buck started to run. My shot spun him around, but he took off again. I waited a while before tracking him. Wade showed up just as I started tracking the big buck. We didn't spot any blood and it was getting dark. I made the decision to wait until morning to start tracking again. I prayed all night for no rain. My prayers were answered, no rain! It had to be the longest day of my life. The next day I got Wade up to go tracking again. We found the buck nose down in the ground, 100 yards away from where we had stopped tracking the night before. It was a beautiful sight and we both high-fived each other. We laughed with a feeling of relief. Craigs St. Lawrence County buck is one of the top 10, all-time, typical bucks taken with gun in New York.